La Pina, the pineapple, is a symbol of invitation and welcome that is placed on the doorsteps of many southern homes. 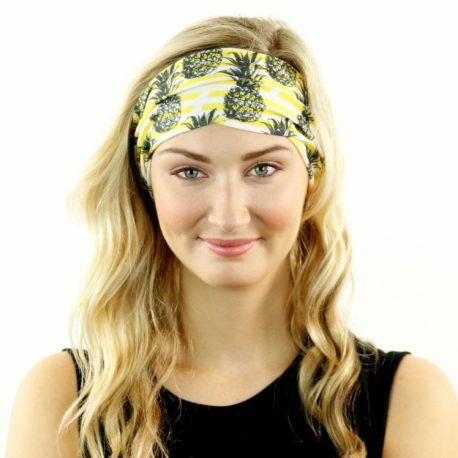 This bright sunny fruit makes a fun summer Half Hoo Headband and, of course, a really yummy drink! Half Hoos are perfect for all you Hooligans who like to rock the rag primarily as a headband, Alice rag, neck gaiter and/or pony tail holder. NOTE: This product is half the size of a full Hoo-rag. Approx. 10” x 9.5”. Up to 30 UPF sun protection rating. 100% moisture-wicking polyester microfiber. One size fits most. Machine wash cold. Line dry. 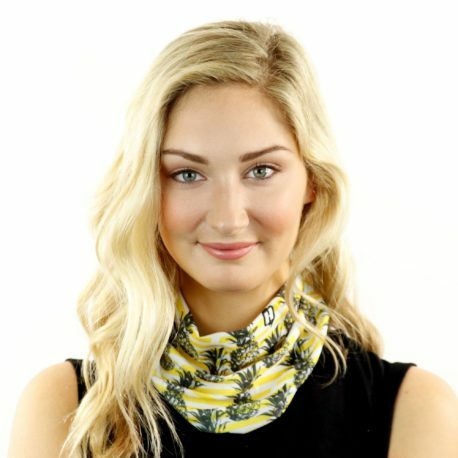 I am obsessed with all of my half-hoos, but this pineapple one may be my favorite! They are comfortable and don’t slip, which is a huge plus for a girl with a teeny head. I wear them working out and just when I’m hanging around. I get compliments every time. Can’t say enough good things! I absolutely love the pineapple pattern. I now own three half hoos and will not run in anything else. Living in the south, I need something that keeps the sweat out of my eyes. These work! !